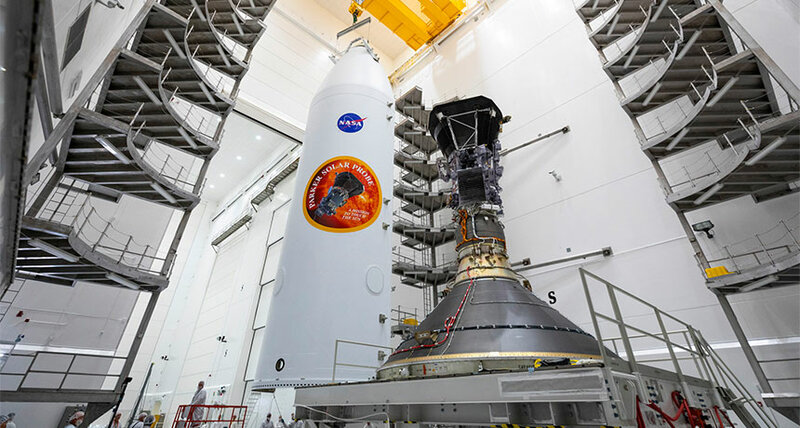 RARING TO GO The Parker Solar Probe is shown here on July 16, 2018, mounted atop the final rocket stage that will take it to the sun and next to part of the casing that will protect it during launch. The probe is set to launch from Cape Canaveral on August 11. Editor's note: The Parker Solar Probe's planned Aug. 11 launch was scrubbed to look into an issue with the rocket's helium pressure. The spacecraft is now set to lift off on its journey to the sun at 3:31 a.m. EDT on August 12 at the earliest. NASA's Parker Solar Probe is ready to reach for the stars - well, one specific star. It's about to blast off to become the first spacecraft to visit the sun (SN: 7/21/18, p. 12). The probe will launch from NASA's Kennedy Space Center at Cape Canaveral, Fla. on a Delta IV Heavy rocket. Lift-off is scheduled for 3:33 a.m. EDT on August 11. You can watch the launch on NASA TV beginning at 3 a.m. If the probe doesn't blast off within 65 minutes of its scheduled lift-off, the launch will be scrubbed - at least for that day. The launch window will remain open until August 23. After that, the team may have to wait another year: Since the Parker probe needs a boost from Venus to enter its sun-skimming orbit, the planets will have to be in the right alignment. Once it reaches the sun, the Parker probe will begin collecting data that scientists hope will help unlock solar mysteries, including why the sun's atmosphere is so hot, how the solar wind accelerates, and more. "We are ready, we have the perfect payload, we know the questions we want to answer," project scientist Nicola Fox, a solar physicist with Johns Hopkins Applied Physics Laboratory in Laurel, Md., said in a news conference on August 9. "We will go touch the sun."